Uniswap, an Ethereum-based, peer-to-peer (P2P) protocol for “automated token exchange,” currently has nearly $10 million locked in its contracts according to DeFi Pulse. Adams, who recently graduated from Stony Brook University with a degree in Mechanical Engineering, noted via Twitter that his firm recently closed a fundraising round. Uniswap’s seed round was reportedly closed last week, with investments made by San Francisco-based hedge fund and venture capital firm Paradigm. According to Adams’ tweet, he will now be working closely with Fred Ehrsam, the co-founder of Paradigm who also serves on Coinbase’s board of directors. Explaining how he got started with his crypto business, Adams mentioned that Uniswap began as “a side project” for him. He added that it was “a way [for him] to learn the required skills to transition from [being a] mechanical engineer” to a cryptocurrency-based project developer. He also stated that this would “not have been possible” without the “support” of Ethereum co-founder Vitalik Buterin and Karl Floersch (a researcher and developer focused on the ongoing development of Ethereum, Casper, and cryptoeconomics). I’ve had so many incredible contributors and supporters. It’s not my intention to diminish this support when I say that through all of this, I’ve been the only person working on Uniswap full-time. In order to help him further expand the Uniswap project, which includes working on management, “research, development, marketing, and fundraising,” Adams has reportedly hired senior engineer Noah Zinsmeister, and a few other professionals to help move the DeFi initiative forward. I am often asked for my thoughts on funding for public good projects. With regards to business model, we are still early in the ideation phase. However, the open and decentralized nature of Uniswap will remain a core value of any project that I lead. Last week, Forbes released its new list of “Blockchain’s Billion Dollar Babies” — i.e., companies implementing blockchain technology that have minimum revenues or valuations of $1 billion. There are more and more major companies adopting blockchain these days. But who has done it best and had the most success because of it? Today, we invite you to share your opinion on the subject. Reply in the comments below! 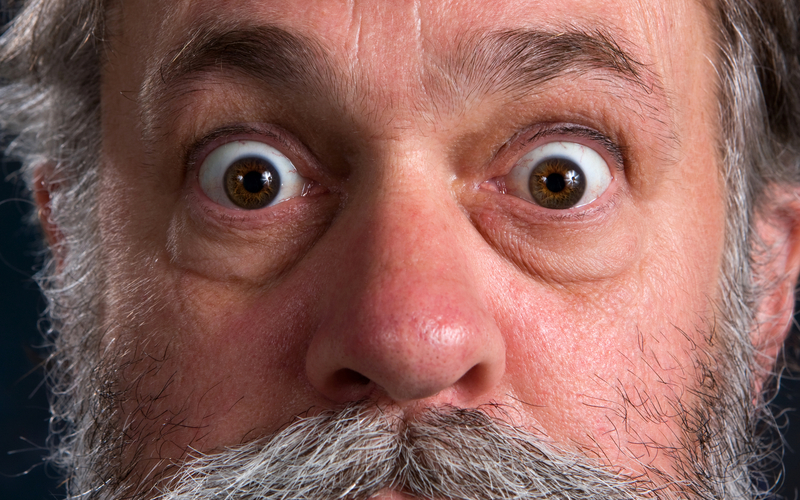 Satoshi has spoken to John McAfee, and he is unhappy that the talented technologist is after uncovering him, ten years after mining the first Bitcoins. With this revelation, Bitcoin (BTC) prices are stable but down 2.1 percent in the last day. The discussion around the true identity of Satoshi Nakamoto, the anonymous founder of the multi-billion platform in Bitcoin, is always an interesting debate. While it is good that the network is as decentralized as it is with no figureheads—unlike Tron or Ethereum for example, the quest for cracking open the seal and pinpointing the brains behind Bitcoin is on and promise to be another thriller for curious followers. After Craig Wright’s decision to slap critics with lawsuits and consequent de-listing from Binance and several other exchanges, there is a new lead from a Bitcoin supporter and perma-bull, John McAfee. Exchanging hands at above $5,400, Bitcoin (BTC) is firm and up 4.7 percent in the last week. Even so, bears are back in a correction, heaping pressure on the coin which as a result is down 2.1 percent at the time of press. Nonetheless, prices are trending above critical resistance levels. Even if traders need prices to firm-up above $5,400 before the next wave of higher highs thrust prices to $5,800, $6,000 effectively reversing losses of Q4 2018, it is imperative that participants keen prices above $5,000. By doing so, buyers of early Apr will be in control. Besides, with BTC trading within a bullish breakout pattern evident in the weekly charge, the path of least resistance will be up as every dip is another buying opportunity. There is a slight over-extension in the daily chart since yesterday’s close is above the upper BB. Regardless, buyers are in control, and from an effort versus result point of view, confirmation of Apr-2 buyers must be with high volumes closing above Apr-23 highs with high volumes exceeding 19k of Apr-11. 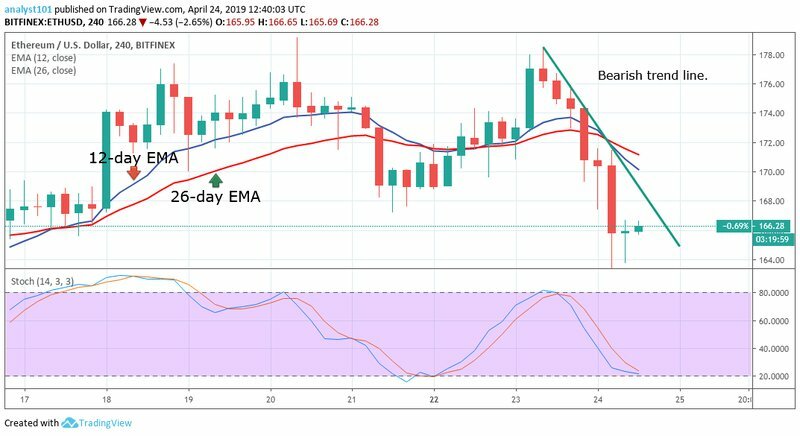 On April 18, the price of Ethereum was in a bullish trend. The bulls reached a high of $176 but could not sustain the price above the 12-day EMA. The bulls were resisted and price made a downward correction and fell to the $166 support level or at the 26-day EMA. 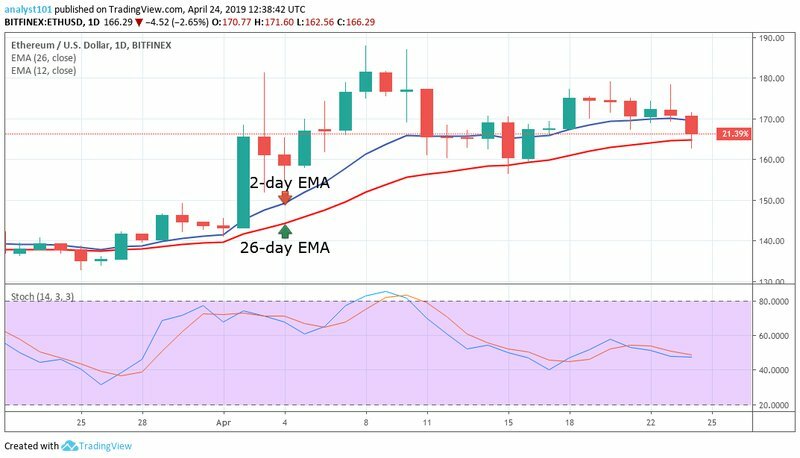 On the upside, if the 26-day EMA support level holds, the crypto’s price will resume its bullish trend to revisit the $170 and $176 price levels. On the other hand, if the bears break below the 26-day EMA, the price will fall to the $140 support level. Meanwhile, the stochastic indicator is at the overbought region but below the 60% range, which indicates that the crypto’s price is in a bearish momentum, and is therefore a sell signal. On the 4- hour chart, the price of Ethereum is in a bearish trend. The crypto’s price fell to a low at $166. The bearish candlestick has been exhausted in the downward trend. The crypto’s price has resumed a bullish trend to break the bearish trend line. Nevertheless, if a bullish candlestick breaks the trend line and another one closes on the opposite of it., the bearish trend is technically terminated. On the upside, if the bulls break above the EMAs, the crypto’s price will be in the bullish trend zone. 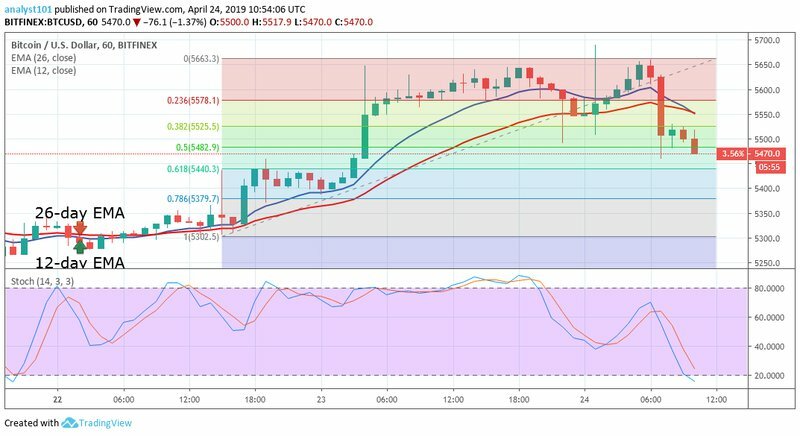 Meanwhile, the stochastic indicator is at the oversold region but below the 40% range, which indicates that the crypto’s price is in a bearish momentum, and is therefore a sell signal. 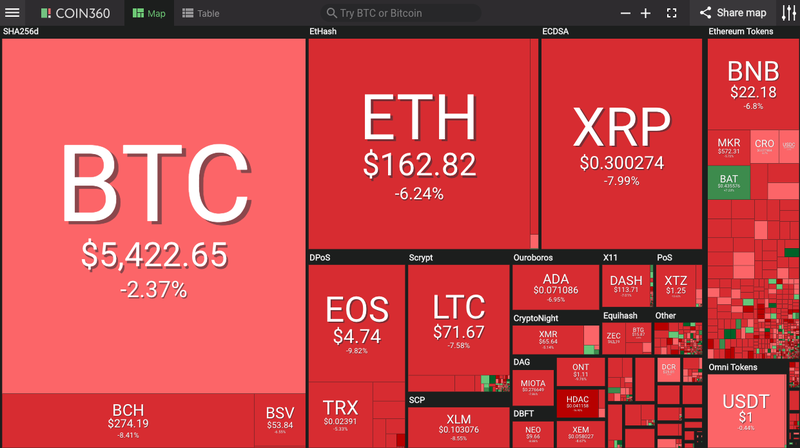 Wednesday, April 24 — after hitting new highs for 2019 yesterday, cryptocurrency markets have again reversed to red, with virtually all of the top 100 coins by market cap seeing major losses on the day, according to data from CoinMarketCap. A former entrant of the top 20 coins by market capitalization, ontology (ONT) is seeing the biggest losses over the past 24 hours at press time among the top 30, down more than 11%. Basic attention token (BAT), which has recently overtaken ontology to enter the top 20, has surged 6%, also up around 30% over the past 7 days. After briefly reaching above the long-anticipated threshold of $5,600, bitcoin (BTC) has now retreated to below $5,500. The biggest cryptocurrency is down 1.9% over the past 24 hours at press time, trading at $5,490, and still up around 4.9% over the past 7 days. Bitcoin hit a new 2019 record at an intraday high of $5,641, while the intraday low amounted to $5,447, according to CoinMarketCap. Bitcoin’s dominance on crypto markets has continued to surge, up from 53.5% in the beginning of the day to the current 54.7%, which is a new market share record for bitcoin since December 2018. Earlier on the day, bitcoin’s market cap has almost touched $100 billion for the first time since mid-November 2018. Ether (ETH), the second-top cryptocurrency by market cap, tumbled 5.5% to $164.9, also seeing a drop of around 0.9% over the past 7 days. XRP, the third-top cryptocurrency by market cap, is down 7.3% and trading at $0.301 at press time, also down 8.8% over the past 7 days. The total market capitalization amounts to $177 billion at press time, down from yesterday’s high of $185 billion. Meanwhile, the daily trade volume has risen significantly to around $55 billion from yesterday’s average of $49 billion. Earlier today, South Korean electronics giant Samsung was reported to be developing an ETH-based blockchain along with its own cryptocurrency token, allegedly dubbed the Samsung Coin. Yesterday, blockchain development firm Lightning Labs officially announced the release of the first alpha version of its Lightning Network (LN) client for the main bitcoin network. Also yesterday, Cointelegraph reported that crypto payments processing startup Moon launched a web browser extension that allows e-commerce shoppers to use their LN bitcoin wallets for purchases on websites like Amazon. While the crypto markets have slipped today, the United States stock market hit new highs over the day, while the Nasdaq (NASDAQ) Composite rose 0.2% to hit an intraday high. Yesterday, Cointelegraph reported that Nasdaq was allegedly testing trading of a bitcoin-based product. At press time, the Dow Jones Industrial Average (DJIA) and S&P 500 (SPX) are up 0.05% and 0.01%, respectively. Oil prices reportedly hovered around six-months highs after the reportedly rising United States’ crude stockpiles countered fears of a tight supply resulting from OPEC output cuts and U.S. sanctions on Venezuela and Iran. Over 24 hours to press time, the OPEC basket is up around 1.3%, while West Texas Intermediate (WTI) crude oil and Brent crude tumbled to 0.8% and 0.4% respectively, according to Oilprice.com. Meanwhile, gold prices rose from the previous session’s four-month low, as a U.S. dollar rally relented and equities softened today, CNBC reports. Spot gold is up about 0.4% to $1,277 per ounce at press time, while U.S. gold futures gained around 0.6% to 1,280 per ounce. The studio, dubbed Oregon Enterprise Blockchain Venture Studio (OEBVS), will be launched in partnership with several local companies participating in the blockchain industry. Namely, the release cites Moda, Umpqua Bank, Portland State University, Oregon Health & Science University, Business Oregon, ConsenSys and blockchain research firm Smith + Crown. Per the release, OEBVS aims to build a blockchain-based ecosystem and help the local businesses and institutions compete globally. The studio will reportedly focus on leveraging emerging startup products, services and tools to solve targeted business objectives for its partners and provide market opportunities, guidance and partnerships. The announcement promises that the startups participating in the program will also receive mentorship from industry executives and obtain access to the company’s partners. OEBVS’ areas of interest include retail, insurance, health, finance, sports, manufacturing, logistics, energy and sustainability, transportation, Internet of Things, smart cities, food, advertising and marketing. Startups can apply to the program through the OEBVS website after April 24. This program will take place out of R/GA’s Portland Pearl District office, starting on July 29, and will conclude in October with a demo event. During the event, each startup will present what they are working on to industry leaders, partners, investors and customers from the tech community. According to Crunchbase, R/GA is an international advertising agency headquartered in New York with an estimated annual revenue of $377.9 million. As Cointelegraph reported last week, world famous tennis player Serena Jameka Williams revealed that she launched her investment business Serena Ventures and silently invested in over 30 companies, including major cryptocurrency exchange Coinbase. Also last week, Reuters reported that venture capital investment in cryptocurrency and blockchain startups will likely set a new all-time high in 2019. EOS is in a bearish trend in its medium-term outlook. With the inverted bearish pinbar formation at $5.54 in the supply area as the market opened yesterday, the bears took control of the market. Full confirmation of the takeover occurred at the break of the 10-EMA before the end of the session. The lower demand area at $4.90 was broken with an engulfing candle as EOS dropped to $4.81. The two EMAs are fanned apart which implies strength in the trend as the bears continue the downward journey. The stochastic oscillator signal points down at 13% in the oversold region. It implies a continuous downward momentum with more candle open and closed below the EMAs. EOS is in a bearish trend in its short-term outlook. The bearish momentum was briefly lost at $5.02 shortly after opening. This brought back the bulls, and price was up at $5.19 in the supply area. This created the bearish flag. EOS dropped to $4.81 in the demand area. Another drop is imminent in the short-term with $4.60 in the demand area as the bears’ target. This was further confirmed by the signal of the stochastic oscillator in the oversold region pointing down. 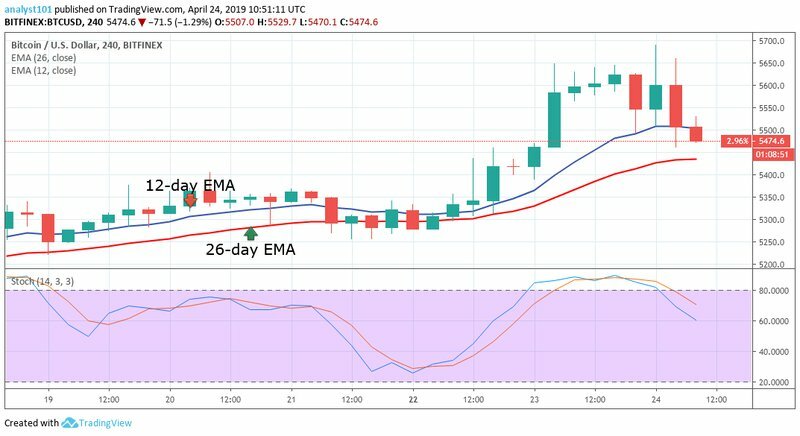 Yesterday, April 23, the BTCUSD pair was in the bullish trend zone. The bulls were facing resistance at the $5,650 resistance level. Today, the bulls were resisted as the price fell and broke the 12-day EMA, but it is approaching the 26-day EMA. On the downside, if the bearish trend continues and the EMAs are broken, the BTC price will resume a downward trend. On the upside, if price falls and finds support at the 26-day EMA , the crypto’s price will resume its bullish trend to revisit the previous highs. Meanwhile, the stochastic indicator is at the overbought region but below the 80% range, which indicates that the crypto’s price is in a bearish momentum, and therefore a sell signal. On the 1-hour chart, the price of Bitcoin is in a bullish trend. Yesterday, the bulls tested the $5,650 resistance level and were resisted. Today, the bulls made another attempt to break the $5,650 resistance level and there was more reaction from the bears. From the Fibonacci tool, the bears have broken the 0.236 and 0.382 retracement levels. This implies that the price has crossed the continuation zone of the bullish trend. The market is now in a downtrend. However, if the price gets to the 0.50 and $0.618 Fib. retracement levels, the current trend is about to reverse. The BTC price is currently trading at $5,485.40 at the time of writing. 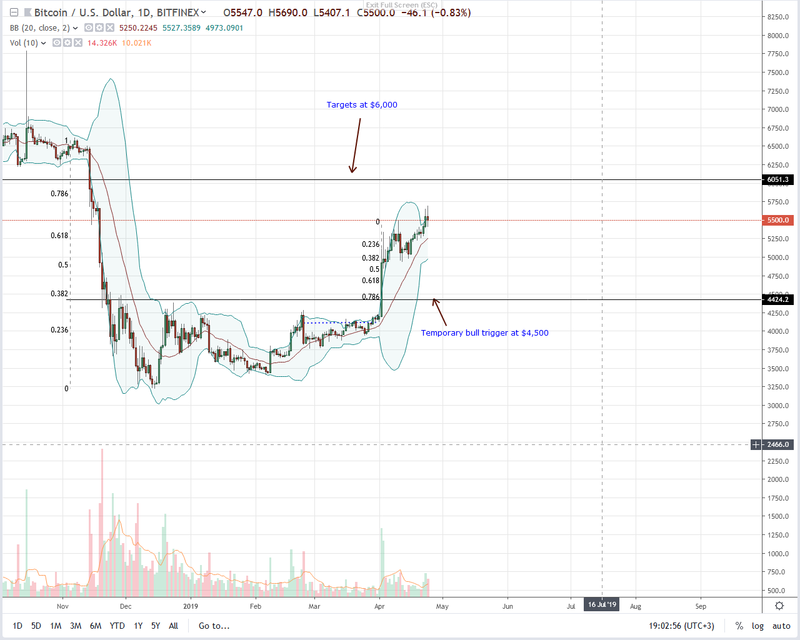 Meanwhile, the stochastic indicator is at the oversold region but below the 40% range, which indicates that the crypto is in a bearish momentum, and is therefore a sell signal. The price is what usually comes to mind first when people talk about Bitcoin. But what was the first ever recorded price of a single bitcoin? And how much it has appreciated since? The evolution of money has historically gone through four key stages. From collectible to a store of value and then to a medium of exchange, and finally a unit of account (such as the US dollar today). What makes Bitcoin unlike any type of money before it is how quickly it became an exchangeable good. Historically, it took eons for people to come to a consensus on a medium of exchange. But then the internet changed everything. However, up until 2009, it still lacked a way to transfer value as it does with information. Bitcoin, being digital, borderless and censorship-resistant, allowed it to leapfrog these evolutionary stages in just a few years. In contrast, it has taken gold thousands of year to transition from a collectible to a medium of exchange and a unit of account (i.e. gold coins). 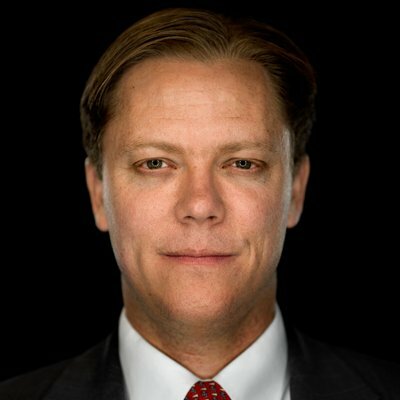 “It started as a collectible [in January 2009] because Satoshi and Hal Finey had it and they had mined the first couple of blocks,” explains Bitcoin investor, Trace Mayer, in an interview with To the Moon host, Max Keiser. And then Satoshi sent Hal some bitcoin…and within a week someone set up an exchange where you could actually trade bitcoins for dollars. 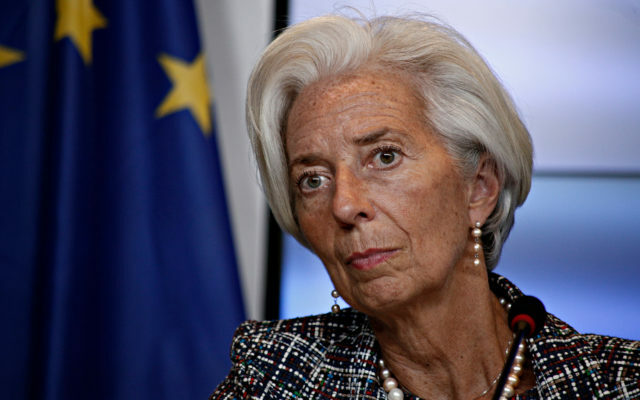 That began to establish an exchange rate ratio. In other words, whereas gold took millennia, bitcoin has jumped “from nothing basically to a $65 billion dollar market cap” in just ten years, notes Mayer. Within a year after its official launch, the price of bitcoin was first published by the New Liberty Standard on October 5th, 2009. On this date, one dollar equaled to 1,309.03 BTC. BTC/USD also ‘crashed’ afterward. Its all-time record low was roughly 1,630 BTC per dollar on December 12, 2009. Though it’s safe to assume that not too many people bought this dip as only a handful even knew bitcoin existed at the time. Today, the price of one bitcoin is around $5,500 USD and with millions of users around the globe. While the inflationary fiat dollar has ‘crashed’ against bitcoin, down to a minuscule fraction of about 0.00018 BTC today. In other words, the price of bitcoin has appreciated a staggering 720,000,000 percent in just a decade since its first ever recorded price. Yes, even a few bucks in 2009 would have got you thousands of BTC making you a billionaire today. Of course, it was much harder to acquire bitcoin then. Your best bet was to directly get some from the small circle of people first using it, Satoshi Nakamoto included. Then the technology started spreading, slowly at first, as small online exchanges began to spring up. Unsurprisingly, however, these digital units of scarcity have managed to integrate rather quickly in the era of smartphones and high-speed internet. This has also allowed Bitcoin to mimic the history of gold as a store of value and money but in a much, much shorter timespan. By being digital and easily transferrable over the internet, Bitcoin spread like wildfire. Today, it is processing hundreds of thousands of transactions a day and settling billions of dollars. What’s more, it is doing it in a decentralized way, peer-to-peer while minimizing the need to trust any central authority. “It’s a huge deal now. It’s shaken the planet to the core,” adds Mayer. Will Bitcoin continue to see astronomical gains over the next decade? Share your thoughts below! Fortune reported on April 23, 2019, that U.S.-based cryptocurrency exchange Coinbase has shut down its Chicago office. The report adds that the exchange would also scale back on its plans to develop a new “matching engine” product to facilitate high-frequency trading for its clients. San-Francisco-based Coinbase is one of the leading cryptocurrency exchanges worldwide offering a host of crypto-based services to its customers. The exchange’s success is nothing short of an inspirational tale in an industry which is still trying to claw its way into the mainstream. The exchange bagged $300 million in Series E fund round in October 2018 which is a testimony to the amount of confidence investors hold in it. In May 2018, Coinbase announced its entry into Chicago to lure local institutional investors and talent. Fast forward to April 2019, the exchange has declared that it’s planning to abandon its expansion in the Mud City and in the process, has let go close to 30 of its engineers. Coinbase’s decision to shutter its business in Chicago is particularly interesting as it comes after a momentous 2018 during which it almost tripled its total employee headcount to around 800 people. The firm carried over its positive outlook towards crypto into 2019 as it recently announced its business expansion into countries like India, South Korea, and Mexico, among others. Speaking to Fortune, a Coinbase spokesperson accepted that Chicago shutdown was a setback for the firm. The representative, however, added that the company is still hiring people into other parts of the business. They further mentioned that high-frequency trading is no longer a priority for Coinbase and that it is now mulling developing other client-focused products including crypto custody services. Coinbase also said that it would continue to maintain a remote sales team based out of Chicago and will work to expand its offices in London, New York, and Portland. However, it remains open to speculation whether the exchange’s Chicago-based employees were told in advance about the impending shutdown as The Block reports that the decision was primarily made at the executive level.